The complete source code for TurboBench can be downloaded from github. make a complete benchmark including html plots. Several entropy coders like FSC, FSE/FSE-Huffman, rans_static, zlibh,... are already there. TurboBench was tested on linux and windows (mingw64). See readme file for downloading and building TurboBench. No additional package installation or configuration is necessary. To include a codec just follow the sample implementation "mycodec" (see file plugins.cc). The calls to the codec functions can be directly inserted in "plugins.cc". There is no need to write any wrapper functions. The lzturbo codecs can be optionally compared by downloading the TurboBench binaries as stated in the github readme. Last edited by dnd; 26th December 2015 at 17:45. Experimental ANS/ABS in vp10 at google. there is implementation of uABS, rABS and rANS - indeed rANS+uABS seems a perfect combination for video compression: switching between large alphabets (DCT coefficients, prediction modes etc.) and binary choices (e.g. if exception happens). - New blog describing "Asymmetric Numeral Systems" implementation at RAD: rANS in practice. Unfortunately, there are no benchmark numbers about compression ratio or speed. Thank you, I've seen that but I'm talking about the entropy coders. You can see in the speedup benchmark sheet and plot, that for a low bandwidth, the load time is dominated by the latency and transfer time. There is only a negligible difference in speedup between lzma and other high end compressors. You can also see in the thread "Transfer Encoding & Data compression" that even a (compressed value) difference of 20% in compression ratio is imperceptible for small files. Accurate results can be obtained only in a real szenario. independent benchmarks make better tests? The goal is to have a general image about the new compression methods. and may be, other file sets. Last edited by dnd; 28th December 2015 at 03:12. There wasn't any point in giving benchmark results in the "rANS in practice" article, since it didn't introduce any new techniques that would help with speed! Buffering up events and then reverse-encoding has nothing to do with speed (and is not new). Interleaving does help with speed but is likewise an old hat by now; there's not much to add that I didn't already say in early 2014! I consider the alternating-stream encoder/decoder to be a much more convenient interface for a 2x interleaved coder, but it is essentially equivalent in terms of speed, as far as it is possible to say such things. For example, if I replace the 2x manual-interleaved coder in the ryg_rans64 example with a 2x unrolled invocation of the alternating-stream coder, I get the same performance (to within measurement accuracy of that testbed), and essentially the same code (up to register assignment and some minor scheduling differences). If I don't do the 2x unroll, it's a bit slower (something like 8% IIRC - visiting relatives right now, don't have access to that code), but still substantially faster than not interleaving, and the ryg_rans example code is really pure entropy coding (very little code), so even loop overhead is not negligible. It's not trivial to untangle what part of the cost is loop overhead and what is the extra MOV you get in the non-unrolled alternate-stream coder variant, and I didn't even try. The bypass coding for raw bits is faster than using a frequency of 1<<k and going through a full rANS encode/decode step, but I likewise never bothered to quantify exactly how much faster. Either way, it's purely a "nice to have" feature; there's little reason not to use it. Finally, the "knot tying" procedure runs once per block flush, so the impact on speed is negligible. Again I mention it mostly because it's convenient - flushing a rANS encoder into another one is nice because it doesn't require separate bit IO machinery, and also because it enables the reduction tree-style flush for wide SIMD/GPU applications. This benchmark falls into the same pit as previous one. But I'm not going to be sarcastic and harsh as I did before. Just a couple of remarks. 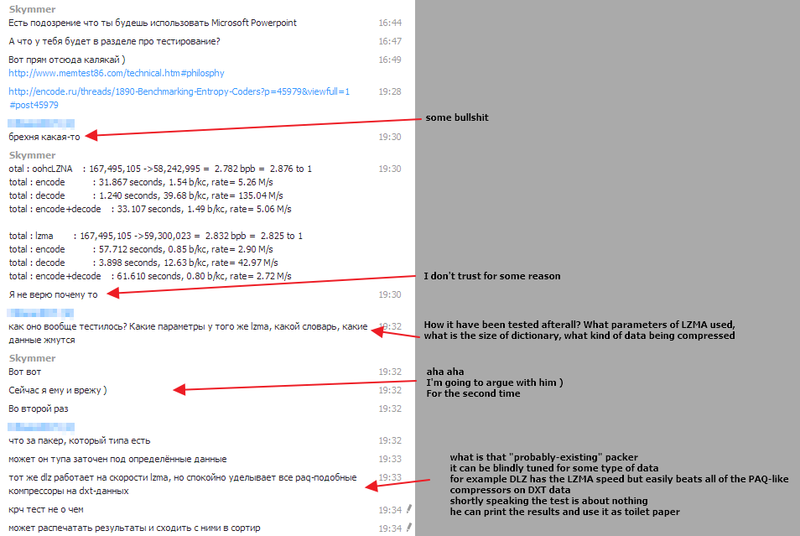 Here is the screenshot taken from Skype conversation with one man about the Oodle benchmark we are talking about. Conversation is in Russian language so I translated it to English. I'm completely agree with him. For example how we should treat the following mutually exclusive phrases ? "LZMA and LZHAM are run at max compression with context bits at their best setting." "all compressors set at high (not max) compression levels." More important question here is how exactly LZMA has been configured. Match finder, parser mode, dictionary size, fast byte value, number of match finder cycles and all other parameters - what exactly values are used ? There is also no information about memory usage during compression\decompression. And I'm not talking about the mistery of the data itself. Its described as "game test set" - well, ok. What is the data exactly ? Textures, meshes, models, pcm audio streams, level geometry, scripts? The page contains the phrase: "As usual, I'm trying to be as fair as possible to the competition." Should I say that your attempt has failed ? If you're going to be fair then provide that data set so we can test it. Nobody forces you to provide the compressor itself. But you can compile the decode-only binaries and publish them, as same as Oodle compressed streams. Without actual proof your benchmark looks like a market-driven masquerade. Sorry. At the moment we are blessed with multiple open-source benchmarking efforts (lzbench, Squash, TurboBench), and it would be nice if some of the closed-source libraries could be added as plugins for comparison. Personally I like the Squash benchmark because it is run on multiple types of hardware, has a set of test data that is available, and is third-party in the sense that there is no commercial interest in making any specific library look good. But I think this is unlikely, since it could be dangerous to submit to testing in an environment you do not control. What if the benchmark does not show what you'd like? Wondering, if you or some others have tried to build the complete squash benchmark. I've also tried to build the squash benchmark for some weeks ago, but abandoned it. I don't know the current status. 1 - from the first line "Building squash" you can read: "Squash currently does not support Windows"
For most users, this remark alone is enough, to not continue reading the rest. 3 - Squash failed to compile on ubuntu (I don't know the current status). 7 - The squash benchmark ouputs only a "csv" file (see coding). I think you need to install the "squash benchmark web" (and a web server?) to see a simple formated output. Well, if someone still think it is simple to use build, use and integrate his own functions into squash, then good luck! TurboBench and lzbench are simple to build. to build or use the plots functions. It is also very simple to integrate your own functions. Last edited by dnd; 30th December 2015 at 14:09. I am sure nemequ can answer your concerns better, but let me add a few notes. I didn't quite get the distinction between the squash library and the benchmark at first, but as I understand it, the library is a general compression library which offers a common interface to a number of libraries that are included as plugins. The benchmark is a seperate project, which uses the library to run the plugins on various platforms, and the collected data is available on the benchmark site. As such, there is no need to compile the entire squash benchmark, or even just the squash library, locally, in order to write a plugin. If you create a pull request, the CI will check that your plugin works, and if it is included, the results will appear on the official benchmark site the next time the squash benchmark is updated. I wrote the BriefLZ plugin on Windows before squash was able to compile there. It didn't take long either, I just copied one of the other plugins for a library with a similar interface. I did check that it compiled in a linux VM though. The next version of the squash library will hopefully have Windows and OSX support, but it is clearly not as easy to build as the other options. I don't think CMake should be an obstacle. It is a pain to use, sure, but I think it has emerged as the lesser evil for building cross-platform when including non-POSIX targets. There are so many projects using it, people should be familiar with it by now. First of all, "Happy new year 2016" for all. I think, the fact that windows is not supported is enough to not consider the squash benchmark. On other operating systems, you must first install and build RAGEL! otherwise cmake fails. Actually, you can't install squash or "squash benchmark" without building it. into the proprietary "squash benchmark". You can't first test, if your plugins are working. You must also spend a lot of time with the squash package and writing plugins. because you must give your libraries for free. Most important, users can't make any benchmark with theire own data and on theire own hardware! are bad for benchmarking speed (cache szenario). Additionally, compressors that shine on small files (like brotli) are favored. - You have a lot of overhead (especially for small files), because the libraries are not called directly. - The plugins are tested with N iterations (I), but in only one run (R = r * I) and only one benchmark. All these issues are considered and processed automatically in TurboBench. You can read more here about the inaccuracy of the squash benchmark. This is one more reason to use only a benchmark program, you can verify the results. Last edited by dnd; 1st January 2016 at 15:22. - Fastest entropy coder. Decoding more than 3 times faster than FSE! I was wondering when you'd rise to the challenge! I'm not sure you can claim it's the fastest still though. Is this using much the same techniques as my 32-way unrolled ANS? Is it rANS or tANS? I'm pretty sure tANS has the legs to be much faster than FSE current implementation (at the expense of needing a lot more state and less efficient on small block sizes). Most of the speed improvement in TurboANX is coming from the new dynamic interleaving. Some of the SIMD technics are already known standards. see for ex. my tweet. I'm claiming nothing but simply interpreting the last benchmark numbers. One must always consider the compression ratio when comparing speed and here TurboANX is playing in another league. How is TurboANX in a different league in compression ratio? Your benchmarks show it having the same ratio as many other compressors, at 63-64%. What are you comparing it to? The level 9 edition is doing better in ratio, at the cost of being vastly slower for encoding. This also only has an effect on the BWT enwiki. Am I correct in guessing that this level is optimising the block boundaries to maximise compression ratio, which is why it works great on a BWT and negligible on the original? This is still a useful change of course, but so is adjusting fixed block sizes and so on. There are other possible solutions too, but we don't know which if any are being used as this is a closed source implementation. Eg shrinking the block sizes so you get finer control over local entropy variability (important on BWT), but not having a random access block model. If you encoding the frequency delta of this block to the previous block then the overheads of storing the frequences of each block are vastly reduced, but you've lost the ability to do any form of random access. What block sizes are used? Can you individually adress any block without decoding the previous blocks? There is a significant difference of 23% for enwik9 bwt between TurboANX and other ANSs. I'm using an entropy based segmentation with a shortest path algorithm on histograms. Each super-block (can be entire file) is segmented into variable size 1-64k small blocks. Random access is possible at the super-block level. Thanks Dnd - it's as I was guessing then. They're both valid and evidently highly useful optimisations of course, plus it's good to see results with and without these too (ANX vs ANX,9) as it shows whether the extra time is worth it will depend on the input file characteristics. I'm curious how speed wise it compares to my r32x16b.c code (see http://encode.ru/threads/2607-AVX-51...0616#post50616 for source & linux binary) on your platform. Ratio won't match of course, at least not with the ",9" switch, as it doesn't have the variable block sizes code. I've integrated your r32x16b into TurboBench and updated the entropy coder benchmark for skylake. The default block size for TurboANX is 12k and 32k the other ANSs. It is possible to set the block size with the parameter -Y (ex. -Y64k or -Y1m ) for the other ANSs. If you want, I can also publish the results with your preferred block size. The optimized TurboANX can be considered as experimental and not usefull for all distributions. I've also a version where the freq. are coded using gamma coding w. a bitwise range coder, but it is slower. Thanks. Nothing wrong with experimental code. It's where it all starts and my own is highly experimental too! The frequency encoding is probably the weak part of my codec. It's a very basic byte shovelling thing at the moment with no delta to previous blocks either. It is however (I think) reasonably quick, if not optimal. Order-1 frequency encoding is probably poorly done! Eg I expect storing the order-0 frequencies and then deltas of order-1 freqs against that would produce smaller tables, but it's not something I've experimented with. Re: block sizes - the 32-way version inevitably is optimised for large block sizes as flushing the state is considerable. My defaults are usually 1Mb because that's the default block of qualities used in the CRAM format (although it's tunable). 128K would be reasonable too, but going much lower is likely to harm speed and/or size, although I haven't checked by how much - perhaps it's fine on 32k and likely the bwt one it'd gain more via small block size due to the nature of the data than it loses through expensive flushing. The order-1 codec in particular doesn't like small block sizes for obvious reasons (the freq table becomes dominant), but again 128K is probably sufficient. I've also found broadwell to be much slower than haswell for my order-1 code, however it's pretty challenging in memory behaviour so it's possibly just other differences in the machine itself causing this. I can't see anything obvious in the chip that would make it slow down. The reason, I think, is 1024*1024 is trivially divisible by 32, making the 32 order-1 pointers have mostly the same bits as each other. 1013*1047 doesn't have this effect. The result is (I'm guessing here) far fewer cache collisions. The same can be seen on other data sets, albeit a bit less noticable. However I'm wondering if this applies to other codecs if they're doing heavy unrolling. Worth experimenting. Last edited by JamesB; 23rd October 2016 at 23:59. Indeed evidence shows the layout matters greatly for the encoder, but not so much the decoder. Infact encoding/decoding from files rather than my in-memory test activated with "-t" shows different performance characteristics. Possibly the in/out block memory alignment is changing too. The test mode decoder runs slower than when decoding from file(!) when using exactly 1MB block size. Anyway, perf is showing nice numbers to back up this theory in part at least. On something like enwik8 the entropy is much higher so the number of order-1 permutations is much higher leading to higher overall used memory access. However it's still 4% vs 10% L1-dcache-load miss rates between the two versions, so significant. The decodes show slightly better cache performance on the 1024*1024 size, so opposite to the expected behaviour. However as mentioned above, the file to file encode/decode is much more even in speed between the two versions anyway. PS. For the same reason, my 4 or 8 histogram buffers for computing the frequencies are sized as (eg) F0[256+MAGIC] where MAGIC is a #define to 8 or similar. This had a huge impact on our older AMD servers with 2-way associative hashes. I see FSE_count_parallel has 256 for these. I should probably benchmark that with a slightly higher number on those servers to see. Array size 256, ewiki8 input *100 trials. - Entropy coder used in AOMedia AV1 benchmarked on Intel Skylake i6700 / 3.4 GHz and RASPBERRY PI3 1.2GHz ARM 64 bits. TurboANXN rANS based entropy coder compress better and is 7 times! faster than AV1 EC. The bitwise (boolean) entropy coder TurboRC is even 3 times faster. Regarding FPC for raspberry pi,there is an unexpected large difference between fpc,0 and fpc,32 for decompression speed. In my tests,using clang on a cortex a53 phone,the speed is similar. I've rerun the benchmark (option -J63) and I'm getting the same results. FPC is getting slower with smaller block sizes. Unlike Skylake, the Raspberry PI benchmark numbers are not stable between the runs. The maximum speed is reported. This is possibly due to throttling.Maybe because compression is slower,it throttles and so decompression becomes slower. Can you test fewer iterations for compression? Yes, very likely. For heavy work loads I recommend to use a heatsink on the chip (of the Raspberry Pi) and ensure proper air ventilation. I've also used the options "-I1 -J63". Turbobench pauses 20 secs after every 8 runs to avoid throtling. One runs is a minimum processing of 2 seconds. With these options used, I'm getting constant results for all other block sizes, so this has nothing to do with throttling. The raspberry PI3 used has already a heatsink. - Not useless, just not as good as Jarek liked to claim. It's a neat technique but hardly a breakthrough. In the end, for AV1, Daala_EC was better. - ... They're not patenting jarek's work, they're patenting improvements they made to it that were necessary to use it in AV1, which they dedicated engineers to do because Jarek declined to do it himself. - ... I can fully believe they verbally promised Jarek far more than he got. - Because Jarek is frankly out of line, and I see no reason to sugarcoat it. Google pissed him off (and I'm sure he has reason to be pissed) but he's not exactly being truthful about what happened, or what is happening. Even, after the evidences in Entropy coding Benchmark, they are still insisting, that the Daala EC in AV1 is better than ANS. The patent scandal was probably a crucial reason behind this decision - even if 16 multiplications per symbol in DaalaEC is faster/more energy efficient/cheaper in hardware than 1 per symbol in rANS, for many years it will be software decoded - where there are absolutely no doubts. I had some direct contact regarding collaboration in a completely different topic March 2016, but it has suddenly stopped like the person has found out that collaboration was impossible due to conflict of interest of they trying to patent my suggestions behind my back without disclosing them. Timothy Lee from Arstechnica was promised contact with someone technical to explain novelty of this patent ... but later got instead only some general comment about great Google patent behavior (... https://www.wired.com/story/eric-swi...awsuit-patent/ ...). The Daala EC (used in AOMedia AV1) is an usual multisymbol (nibble) range coder. In decoding, a division is normally required for the symbol search. For nibble decoding it is possible to avoid the division, by using up to 16 multiplications (like in Daala EC). In my benchmarks using a division is faster. My benchmarks also show that bitwise (boolean) decoding is faster, so there is no reason to use a multisymbol range coder. Only rANS with SIMD nibble decoding can be faster than a bitwise range coder. Symbol search can be done without any multiplication. Only one multiplication is required to update the ANS state.